A hijacked Metro bus hit and killed a pedestrian in the District on Tuesday morning. 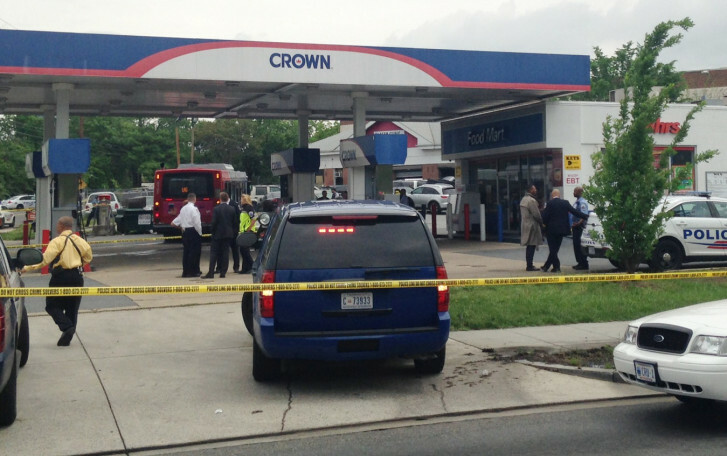 WASHINGTON — An armed Metrobus rider fought with the driver, commandeered the bus and then struck and killed a pedestrian at a nearby gas station all within the span of several minutes in what police called a “bizarre” ordeal in D.C. Tuesday. D.C. Police Chief Cathy Lanier said the boarded the U6 bus about 10:30 a.m. in the 3800 block of Jay Street. Seeing the commotion, passengers escaped the bus through the rear door. The driver also fled, but not before hitting an emergency button, summoning help. The hijacker closed the doors, took the wheel and drove just a few blocks before losing control of the bus. Police say the Metrobus jumped two curbs before it hit a pedestrian who was in the parking lot of the Crown gas station at the corner of Minnesota and Nannie Helen Burroughs avenues in Northeast. The pedestrian was taken to the hospital where he was pronounced dead, Lanier said. He has been identified as 40-year-old Anthony Payne of Northwest, D.C.
Police met the bus at the gas station and quickly took the hijacker into custody. Police said the man was distraught and violent. He has been identified as 30-year-old Keith James Loving, of Northeast, D.C. Police said he has been charged with second-degree murder. Police have not said what kind of weapon the man was carrying. Lanier called the incident “bizarre” and said it was unusual for someone to try to steal a bus. Metro Transit Police tweeted that the bus driver was hurt but that his injuries were not life-threatening. None of the passengers was injured. Loving was also taken to the hospital but it was unclear whether he was injured. Assaults on Metrobus drivers jumped in 2015, most the result of fare disputes. Metro has begun installing plastic shields in its buses to separate riders from drivers and now plays announcements at each stop reminding riders that the base fare is $1.75. In April, union leaders and bus drivers met with Metro officials to discuss the growing safety concerns. The Amalgamated Transit Union Local 689, which represents Metrobus drivers, has been calling for a greater police presence on buses and on the rails, union spokesman David Stephen told The Associated Press. WTOP’s Rick Massimo and Meg Hasken contributed to this report.